When Molly Wizenberg married Brandon Pettit, he was a trained composer with a handful of offbeat interests: espresso machines, wooden boats, violin-building, and ice cream-making. So when Brandon decided to open a pizza restaurant, Molly was supportive not because she wanted him to do it, but because the idea was so far-fetched that she didn't think he would. Before she knew it, he'd signed a lease on a space. 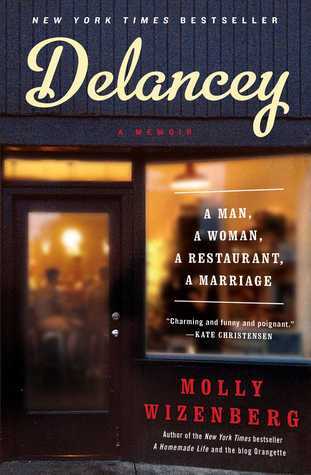 The restaurant, Delancey, was going to be a reality, and all of Molly's assumptions about her marriage were about to change. Together they built Delancey: gutting and renovating the space on a cobbled-together budget, developing a menu, hiring staff, and passing inspections. Delancey became a success, and Molly tried to convince herself that she was happy in their new life until in the heat and pressure of the restaurant kitchen she realized that she hadn't been honest with herself or Brandon. I found this book to be what I was hoping it to be. A good honest look at a couple and the ups and downs of the restaurant life. I think this book shows some of the struggles, with finding a location, remodeling, picking menu items, hiring people, permits etc. Also how what worked for them and what did not for them. How the stress of the business put a strain on their marriage and how they found that she is good with the books, money etc. and he is good in the kitchen. For me them getting to that point was huge and really like any partnership, weather marriage or business you need to find the strengths of each other and focus on those. Once they did they not only strengthen their marriage but also their business as well. The book is also filled with recipes that I thought was a nice touch. Overall a good book about the ups and downs of restaurant life, not all restaurants make it , so hats off to them. I got this book from net galley.